Boletellus projectellus (Murill) Singer is recorded for the first time from Europe, based on collections made in Lithuania, Curonian Spit. Morphological features and analysis of ITS sequences supporting the identity of the species are provided. Ecology, distribution and status of B. projectellus in Lithuania and in Europe are discussed. 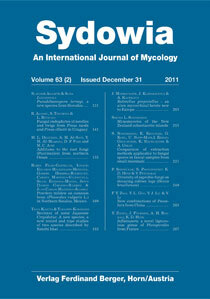 Keywords: fungi, Basidiomycota, Boletaceae, phylogeography, invasions.